Any way you put it, your hair suffers. Every day we expose our hair to different things that do harm. Sun exposure, for starters, can be harmful to your hair. Extreme heat and extreme cold damage your hair. Dyeing your hair can also do some damage. Now, I’m not saying you shouldn’t dye your hair. But remember, your hair needs care as much as any other part of your body. I want to give you some natural remedies for hair growth. I know you can get hair treatments at the hairdresser. But these treatments are expensive. Believe me, I know. I’ve had a few of them myself. I had a problem with hair loss a year ago, but I started using natural products, and my hair is in much better shape. So I’m going to share some of those natural remedies for hair growth with you, so that your hair looks shiny and healthy. Amla, or Indian gooseberry, is the first product on the list. The most important thing you need to know is that Indian gooseberry prevents hair breakage. And that’s more than enough. But Amla does much more by stimulating hair growth and straightening your hair follicles. Mix the ingredients together for a few minutes. Apply the juice on the scalp and let it stay there for 2 hours. Let the juice dry on its own. I know most of you use curry leaves in the kitchen. They add great flavor to any dish. But you can use this cooking staple for hair growth as well. Coconut oil is another great product you need. Start by boiling the two ingredients together. You’ll notice a black residue forming; it’s that residue that you’ll apply on your hair. Apply the residue two times per week at night to stimulate hair growth. This is probably one of the simplest masks you can make for hair growth using natural remedies. 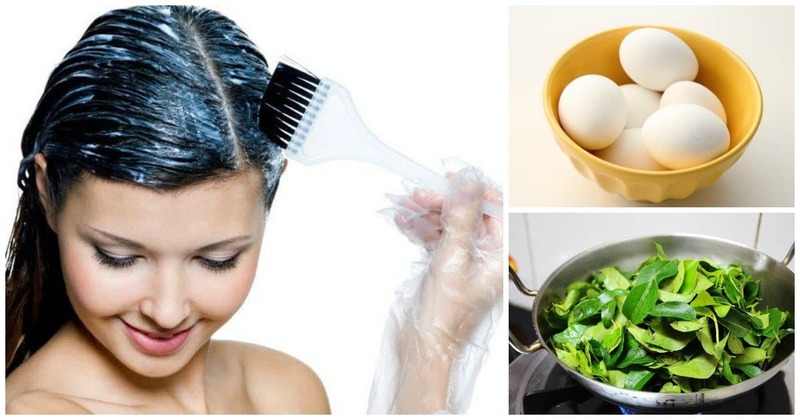 Whisk the egg white, and then apply on your hair. Let the mask stay on your hair for 15 minutes. The protein from the egg yolk will nourish your hair and provide healthy ingredients for hair growth. An abundance of antioxidants in one place. Honey contains the most antioxidants of the mix, but the other ingredients help. We had a simple egg mask, and this one takes it to the next level. Believe me, your follicles will be thankful. Mix all ingredients in a bowl to get a smooth paste. Apply the solution on your hair. Wrap your hair with a towel, and let the solution sit for 20 minutes. Rinse once with lukewarm water, then apply mild shampoo and wash your hair thoroughly. Honey can be sticky, but if you dilute it with the other ingredients, you have nothing to worry about. And besides, you’ll wash it out afterwards. Start by mixing honey and cinnamon in a bowl. When you get a smooth mixture, add the hair balsam. Wash your hair, and dry it halfway. While drying, use a comb to separate your hair into strands. Brush your hair with the solution (try to apply it to each strand). Alternatively, apply this mixture with your hands and massage throughout your hair. Put your hair in small bun. Cover it with a plastic bag or a towel. Let the mask stay on for 30 minutes, and then remove the bag. This is another simple mask for which you need only a few ingredients. Castor oil is rich in vitamin E, which is why you use it for hair growth. This mask will improve the health of your follicles and your scalp as well. Use the ingredients in 1:1 ratio. Dilute the castor oil and mix the two ingredients together. When you get a smooth mixture, massage the solution on your scalp. Using a mild shampoo, wash your hair thoroughly. Speaking of vitamin E and its benefits for hair growth, you can go directly to the source. If you don’t like castor oil, you can use vitamin E essential oil. I’d recommend diluting it with another oil, but some people prefer using it raw. Massage your scalp with vitamin E oil. I leave to you to choose whether you dilute it or not. Cover with a plastic bag, and let the solution stay on your hair overnight. Wash with a mild shampoo in the morning. I’m sure you know this, but there is simply no cosmetic product without some aloe vera in it. This simple plant is one of the best at relieving inflammation and taking care of your skin. You can apply the mask on your scalp and hair for a silky smooth and soft feeling. Use the solution as a shampoo. One of the healthiest ingredients you can find. People call garlic “the best doctor you can get.” Packed with healthy ingredients, garlic helps with any inflammation. As for your hair growth, garlic is packed with allicin, a chemical compound that stimulates the growth of your hair. Apply the mixture on the roots of your hair. Don’t wash your hair after applying. If you prefer something lighter than garlic, go with onions. Onions contain small doses of allicin, but they also contain sulfur, another key compound for hair growth. All you need is few onions. Grate your onions in order to extract the juice. Apply the juice on the scalp, wrap with a towel, and let it sit for 30 minutes. Wash your hair using a mild shampoo. Repeat once per week. The staple food for any dish can do some magic for your hair as well. Potatoes are rich in many nutrients, but mostly, you want the potassium and iron from their juice. In addition, potatoes are rich in vitamins like A, B, and C.
Start by extracting the juice from the potatoes. For one cup of potato juice, you’ll need approximately 2 potatoes. Wash your hair and it dry just until it is damp. Apply the mixture. Let the solution sit on your hair for 30 minutes. Wash with a mild shampoo. There are few simpler natural remedies for hair growth than apple cider vinegar. Mix the ingredients to dilute the apple cider vinegar. Store in the fridge. Use the solution to rinse your hair. You can wash your hair with shampoo, and then rinse with the ACV solution after washing. We are nearing the end of the list of natural hair growth remedies. And we can’t forget lemon juice. If vitamins are what you need, lemon juice brings it to the table. A tested remedy, lemon juice will help your hair grow, but also look shiny and healthy. Mix the two ingredients in a bowl. Make sure to warm the coconut oil in your hands to make it liquidy. Apply the solution evenly on your scalp and hair. Let the solution sit for 60 minutes, and then wash with a mild shampoo. Don’t throw your used tea bags away. Green tea is rich in antioxidants, and you can use them to your benefit. Brew the tea and drink it, and then use the tea bags for hair growth. Just apply the tea from the tea bags (when not too hot) on your scalp, and let it sit for one hour. Then wash it off with cool water. Thanks for this remedies, all I want is just faster growth of my hair so I’m going to give the olive oil and onion method a try. Cheers.